New this month Revealing mistake: Cleopatra rides a sphinx during her spectacular introductory parade in Rome. Just as the Sphinx is about to pass through the Roman arch, sunlight casts shadows of the open girder lattice behind the Arch's facade. Factual error: The Forum shown in that film is smaller than in real life. Also, Cleopatra is shown passing through the Arc of Contantine, a monument that was built centuries after her death. Factual error: The Roman legionaries are using armor and shields first used over a century later, and there are no transverse crests to mark the many centurions that would have been in each unit. 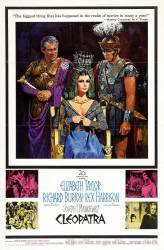 Factual error: Cleopatra's barge shows that it has linoleum flooring. However, much marble would have sunk the barge because of its weight. Deliberate mistake: In order to get to Julius Caesar and evade her nasty brother Ptolemy's assassins, Cleopatra concealed herself in a rug that she has a slave carry to Caesar. Look at the furled rug the slave carries on his shoulder. Then watch Cleopatra fall out as the slave tosses the rug to the floor and unfurls it. The slave would have needed wall-to-wall carpeting to hide her. Visible crew/equipment: When Cleopatra enters Rome sitting on top of the platform pulled by the slaves, you can see the head of the guy driving it through a small window in the front.